Sensorsoft Alert is a standalone network appliance that allows you to protect equipment and products that might be damaged by undesired environmental conditions. Sensorsoft Alert can use the complete series of Sensorsoft devices to monitor temperature, humidity, flooding, power loss and dry contacts. Using built-in Sensorsoft Plug-in technology, Alert can support most any third party serial device*. 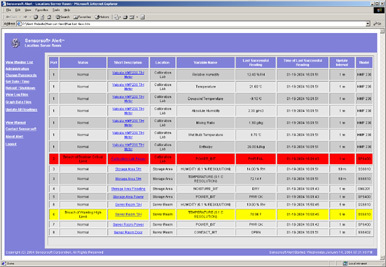 Sensorsoft Alert can be managed from a web browser or SNMP management software. It operates as a standalone appliance that collects and displays sensor readings, logs data, and most importantly - alerts your staff when environmental conditions become unacceptable. Sensorsoft Graphing Tool (SGT) has been integrated into Sensorsoft Alert for a complete solution allowing you to profile and graph data with as little as two mouse clicks. * Sensorsoft Plug-in technology works with Class 1 (RS232) serial devices. Sensorsoft defines Class 1 devices as those having a simple ASCII based protocol that work on a master/slave or command/response basis. These devices do not use binary data or checksums. Sensorsoft Plug-in support for a variety of Class 1 devices is available through Sensorsoft using our Plug-in Wizard. If you have a device you would like supported please contact us.